From its humble beginnings, WrestlingMart has grown to be the world’s largest wrestling retail showroom. The showroom and store is located in Southern California, the heart of one of the largest wrestling communities in the United States. We have a passion for the sport of wrestling and for helping our customers. In addition to selling wrestling shoes, we look to inspire, educate, and serve wrestlers and the wrestling community as a whole. Whether you are in our showroom, talking to us on the phone, or ordering online, everyone at WrestlingMart is dedicated to helping you with enthusiasm and an extensive knowledge of our products and the sport of wrestling. WrestlingMart was founded in 2002 by two friends who wanted to bring their passion for wrestling to the wrestling world at-large. Since its inception, WrestlingMart has been committed to providing the sport of wrestling with the unbeatable customer service and top quality products. After establishing a presence with our online store, we saw an opportunity that we weren’t taking advantage of. We knew how challenging it could be, especially for new wrestlers, to pick out all the right gear and get the correct sizes. No sporting goods stores (that we could find) had either the selection or the knowledge to properly help wrestlers of all levels find the best gear for both training and competition. So, we opened up a small storefront on Rancho Santa Margarita to do just that. We soon re-located to Irvine when we realized the unique market position it offered. Our location in Irvine is easily accessible and centrally located in Orange County, California, between San Diego, Inland Empire, and Los Angeles. Our proximity to the I-5 and I-405 freeways makes it convenient for any of the thousands of wrestlers in the area to stop by. We now are able to individually help every wrestler that comes in to find exactly the right wrestling gear they need from start to finish. We also realize that not everyone can get to our showroom, so we work hard to offer expert level customer service over the phone, via email, and online. We love our customers. We will bend over backwards, and suplex whoever we have to in order to provide the best customer experience possible. We stand behind the quality of all of our products, and offer competitive prices on both individual and team gear. Like any dedicated crew of wrestlers, we have one common goal: we want to WIN! We want to win with our customers, the wrestling community, our vendors, our employees, our gear, our service and our prices. We aim to not only be the go-to place for the absolute best wrestling gear, but also the industry leaders on product knowledge and customer service. We are dedicated to being a resource for our customers and the wresting community at large for years to come. Our Staff is a stacked line-up of only wrestlers: NCAA All-Americans, State Champs, State placers, and other highly experienced wrestlers. We’re all plugged into the wrestling community outside of WrestlingMart and love giving back to our great sport. Our knowledge of the sport is in-depth and comprehensive. We’ve lived it, and still continue to learn every day; we know both the wrestling culture and the products. You can rest assured we’ve got a good grip on things, and will be open and honest in getting you exactly what you need. Our Showroom is one of a kind. 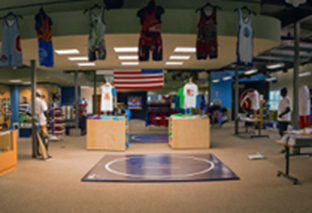 We have the largest wrestling-gear-only showroom in the world. We get first hand feedback from local wrestlers on a daily basis. This gives us a wealth of knowledge on the nitty-gritty details of our products that goes unmatched. Our Attitude is positive, forward thinking, and tireless. We have the mindset of champions, and we are committed to winning with our customers. We are always learning, and always improving, which means we’re going to make some mistakes in our continual process of growth. You can help us improve faster by giving us any feedback you have. Our Biggest Objective is to do our part in making the sport of wrestling thrive, and be a resource to our customers and our community.